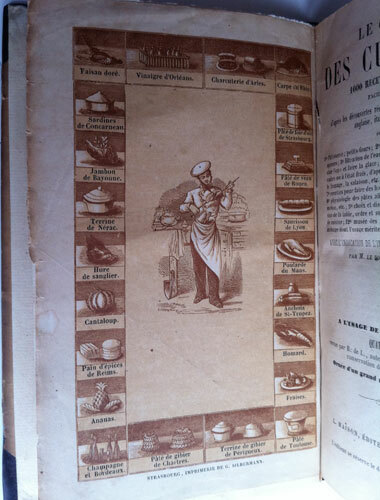 1000 RECETTES DE CORDON BLUE FACILES ET ECONOMIQUESd'apres les decouveries recentes de la cuisine francaise, provencale, anglaise, italienne, suisse et allemande; 1° Patisserie; petit-fours; 2° office: confitures, sirops, fruits confits, li-quers; 3° filtration de l'eau et autres liquides; 4° procedes pour rafrai-chir l'eau et faire la glace; 5° conservation des substances alimentaires cuites ou a'l'etat frais, d'apres la methode d'Appert, par le dessiccation, le fumage, la salaison, etc; 6° choix, conservation et emploi des vins; 7° recettes pour faire des boissons economiques, grog et eaux gazeuses; 8° physiologie des pates alimentaires, des fromages, des poissons, du melon, etc; 9° choux et dissection des viandes et des poissons; 10° ser-vice de la table, ordre et soins de proprete; 11° dictonnaire des termes de cuisine; 12° musee des menages, choix d'ustensiles de cuisine et de menage dont l'usage merite d'etre recommande. AVEC L'INDICATION DE L'INFLUENCE DE CHAQUE METS SUR LA SANTE PAR M. LE DOCTEUR JOURDAN-LECOINTE. "A trente-deux aus, mon estomac ne digerait plus aucune espece de mets travailles par nos meilleurs cui-siniers: j'essayai de les preparer moi-meme sous un maitre habile qui dirigea mes premieres essais. Apres quinze aus d'experience et d'analyses sur nos preparations alimentaires, j'ai recuelli un grande nombre d'observa-tions sur cette mattiere importante. <> A L'USAGE DE TOUTE LES FORTUNES. 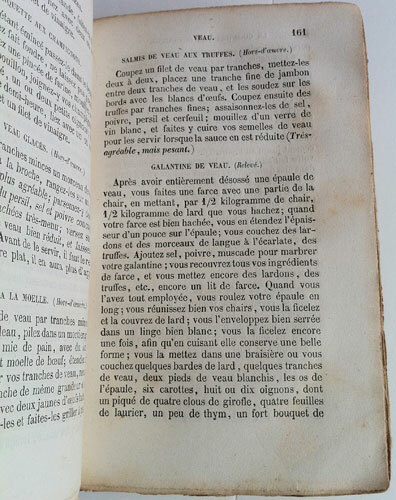 QUATROZIEME EDITION, revue par r. de L, auteur de plusieurs procedes relatifs a'la conservation des substances alimentaires. ORNEE D'UN GRAND NOMBRE DE GRAVURES SUR BOIS. PARIS, L' MAISON, EDITEUR, RUE DE TOUNON, 17. 1856. L'editeur se reserve le droit de reproduction et de traduction. 190x125x45mm. 1fep. Half-title and on verso Frontispiece. Title page - on verso Division de l'ouvrage. 2p Au Lecteur. (1)4-24 Table Generale. (1)26-36 Table de Service. (1)38-645. 1p Ouvrages Recommandes. 1fep. The front and back covers are the original decorated cardboard ones, age browned but still clearly visible. 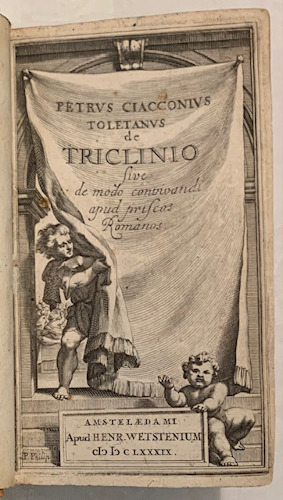 The frontispiece is an exact copy of the front cover. The spine has been relaid in modern dark brown calf, with raised bands, gilt tooled devices in the compartments with two labels in red and green morrocco respectively, both with gilt lettering. Very clean inside except for the last chapter; Musee des Menages p612-645 which is evenly but lightly foxed throughout due to bad paper. All pages are original untrimmed size with some uncut. A nice copy overall. 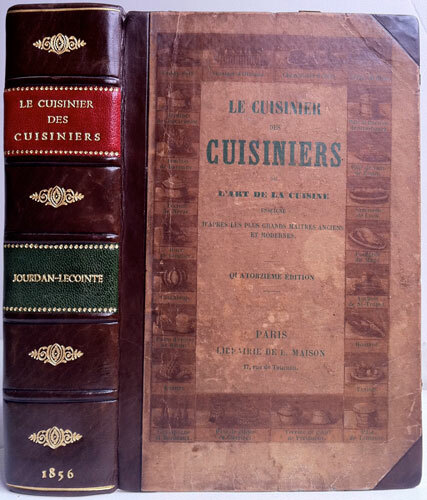 - Docteur Jourdan-Lecointe published three cookery/gastronomic books… this one, ‘Le Cuisinier des cuisiniers’ which was first printed and published 1825. Also ‘La Cuisine de santé’. 3 volumes. First edition, Paris 1789. Cagle holds a re-issued copy of ‘La Cuisine de santé’, re-titled ‘La Cuisinier Royale ou Cuisine de Sante’ and dated 1792. He also informs that no other copy has been located. 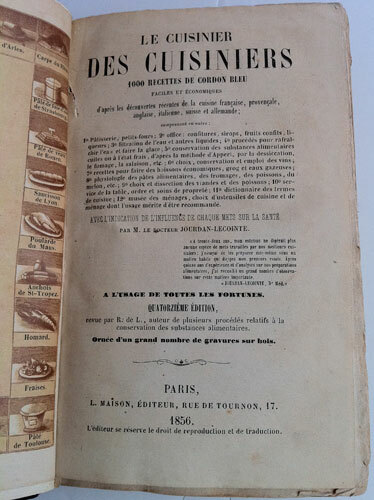 ‘La pâtisserie de santé’ was originally published in Paris, 1790. 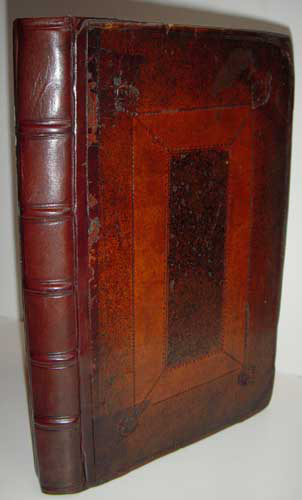 Cagle has an un-recorded third edition of 1793. Vicaire records the 1792 edition. Kent. Elizabeth Grey, Countess of - A very rare 'ladies closet' revealed. Collected, & practised by the Right Honourable the Countess of Kent, Late deceased. 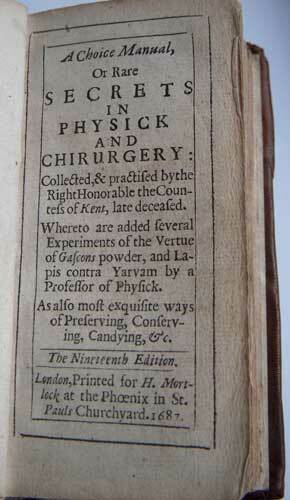 Whereto are added several experiments of the vertue of Gascons powder, and Lapis contra Yarvam by a Professor of Physick. As also most exquisite ways of Preserving, Conserving, Candying, etc. The Nineteenth Edition. London, Printed for H. Mortlock at the Phoenix in St. Pauls Churchyard. 1687. WITH A SECOND PART: A True Gentlewomans DELIGHT. 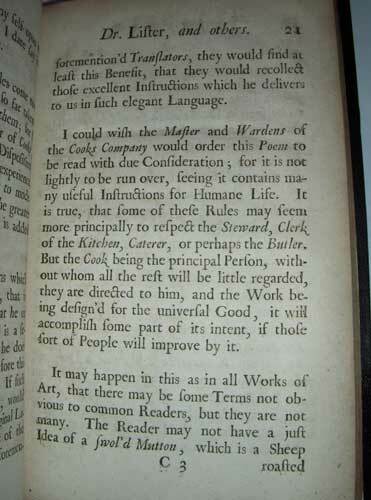 Whereinn is contain'd all manner of COOKERY. Together with: Preserving, Conserving, Drying, and Candying. Very necessary for all Ladies and Gentlewomen. Published by W.G. Gent. LONDON, Printed for Henry Mortlock, at the Phoenix in St. Paul's Churchyard, 1687. Small 12mo. Portrait frontispiece. (it has been bound in on the recto instead of the usual verso) Title page. 2pp Epistle by W.J. 2pp 'To the Reader' 10pp 'Contents' (1-234) THE 2ND PART: Separate pagination - 6pp 'Table of Contents' Title page. 2pp Epistle by W.J. 2pp 'To the Reader' 14pp 'Contents' (1-140) Contemporary black goatskin boards re-laid, surface quite worn but with a nice patina. Dark calf, blind ruled spine re-laid, blind fillet border on sides, re-cased using old paper, new sewn headband, very sound. Internally very clean with mild overall aging. - Elizabeth Grey, Countess of Kent, born December 7th 1582 - died 1651, née Lady Elizabeth Talbot, was the wife of Henry Grey, 8th Earl of Kent. She was a daughter of Gilbert Talbot, 7th Earl of Shrewsbury and Mary Cavendish. She married Grey on November 16, 1601, at St Martin's-in-the-Fields. They had no children, and the Earl died in 1639. Afterward she is thought to have married the writer, John Selden, who had worked for the Earl. 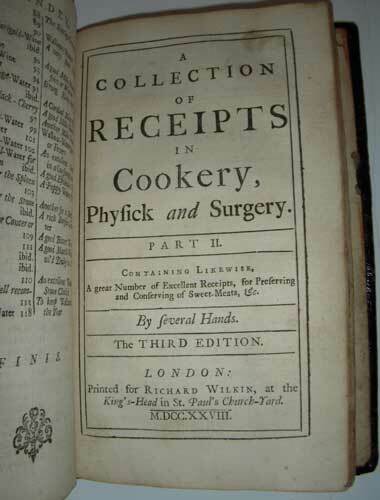 After her death, her collection of medical recipes was published as 'A Choice Manual, or Rare Secrets in Physick and Chirurgery Collected and Practised by the Right Honourable the Countess of Kent, late deceased'. 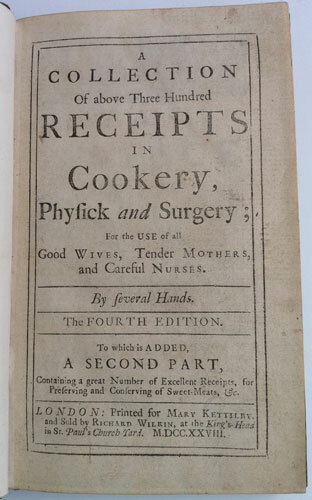 Her collection of cookery recipes were also added to the book as a second part. It was an interest she shared with her younger sister, Alethea Howard, Countess of Arundel. Sometimes, complete and separately bound copies of the 2nd part - 'A True Gentlewoman's Delight' are sold at auction, one such being offered at Bloomsbury Book Auctions in 2006. However complete copies like this one with both parts present are rare and much more desirable. 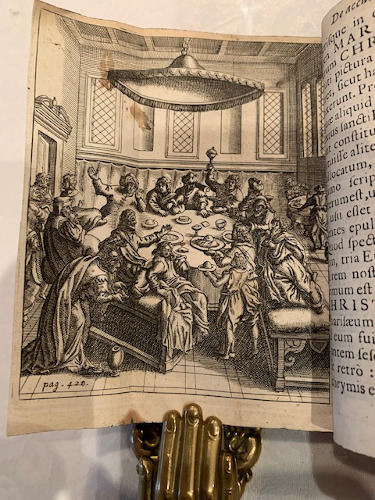 This book, because of its small size (not much bigger than a miniature) and having the original cover, with the frontis of the Countess's rather crude but interesting portrait and the thick text block with under-developed remedies and recipes, has the ability to stop a person in their tracks. Keeping in mind the method now to digitally produce very glossy, high resolution, colourful cookery books, that on reflection, when held against this very old book, gives one a sharp sense of both that time and now, and the amazing changes to our world in those 323 intervening years. It also makes one ponder on how our endeavors will be viewed over 300 years from now; with the same sense of incredulous wonder I should imagine! 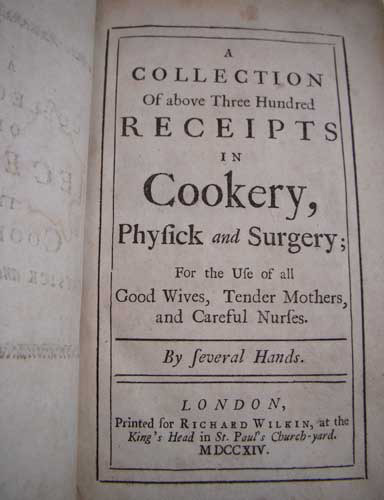 IN Cookery, Physick and Surgery; For the USE of all Good Wives, Tender Mothers, and Careful Nurses. By several Hands. The FOURTH EDITION. 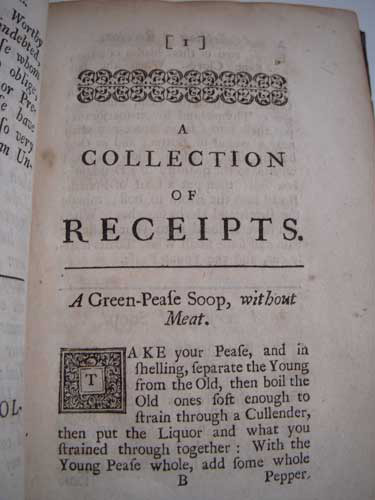 To which is ADDED, A SECOND PART, Containing a great Number of Excellent Receipts, for Preserving and Conserving of Sweet-Meats, &c. LONDON: Printed for Mary Kettilby, and Sold by RICHARD WILKIN, at the King's-Head in St. Paul's Church-yard. M.DCC.XXVIII. 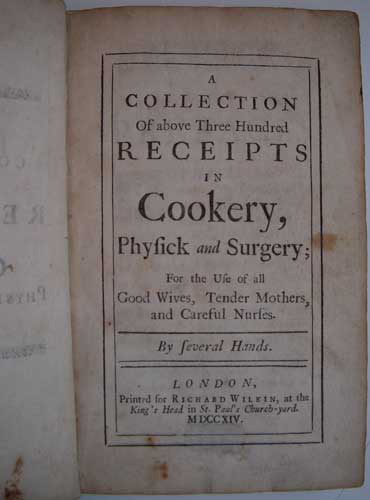 -- SECOND TITLE: A COLLECTION OF RECEIPTS IN Cookery, Physick and Surgery. PART 11. Containing Likewise, A great Number of Excellent Receipts, for Preserving and Conserving of Sweet-Meats, &c. By several Hands. The THIRD EDITION. LONDON: Printed for RICHARD WILKIN, at the King's-Head in St. Paul's Church-yard. M.DCC.XXVIII. 8vo. Decorated silk paste-down and end paper. 2feps. Title page with a double lined border. (1)iv-viii Preface. (1)10-183. 7p Index. Second Title page with a double lined border. (1)194-272. 4p Index. 2feps. Decorated silk paste-down and end paper. Quarter dark brown calf with marbled boards and tips with blind tooled lines. Spine with raised bands, with gilt devices in compartments with gilt title. Inernally very clean, with a very slightly dusty title page, and last page of index. Overall in very good condition. 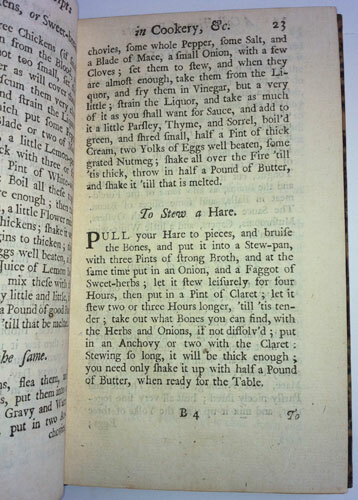 - From an interesting article online called the 'History of Wafers' we learn of a recipe in Mary Kettilby's, 'A Collection of Above Three Hundred Receipts' (London: 1724) called, "The Right Dutch-Wafer -- Take four Eggs, and beat them very well, then take a good Spoonful of a Pint of fine Sugar, one nutmeg grated, Cream, and a Pound of Flower, a Pound of butter melted, two or three Spoonfuls of Rose-water, and two good Spoonfuls of Yeast; mix all, well together, and bake them in your Wafer-tongs on the Fire. For the Sauce, take grated Cinnamon, Sack, and melted Butter, sweetened to your Taste." This sounds like an early Belgian Waffle where Kettilby calls for yeast instead of beaten egg whites to lighten the wafer/waffle. A fine example of how recipes develop over the years and in tandem with those of different geographical locations. Its amazing how the key elements of demand, equipment, foodstuffs, cooking knowledge and skills produced dishes that had many similarities throughout the main European cuisines. 8vo. Marbled paste-down and end paper. 2feps. Title page with a double lined border. (1)iv-viii Preface. (1)10-183. 7p Index. Second Title page with a double lined border. (1)194-272. 4p Index. (1)2-8 Advertisements. 2feps. Marbled paste-down and end paper. Quarter green morocco with marbled boards. Sun faded spine with raised bands, with sharp gilt devices in compartments with gilt title. Inernally very clean with a very slightly dusty title page. Overall very good condition. 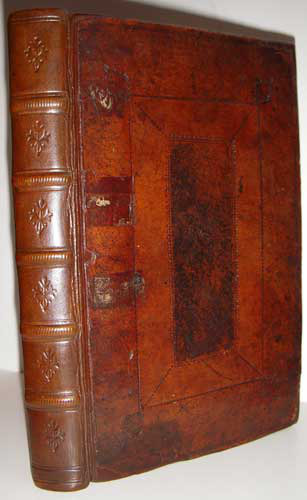 - This fourth edition has a second part - third edition, but they are both dated 1728. For the Use of all Good Wives, Tender Mothers, and Careful Nurses. By several hands. LONDON, Printed for RICHARD WILKIN, at the King's Head in St. Paul's Church-yard. MDCCXIV. 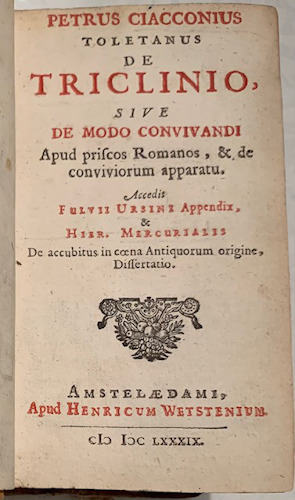 FIRST EDITION 1714. 8vo. Pp. Half title. Title page. 12. 1-218. [219-232] Full contemporary two-tone dark brown calf boards with nice polished patina. Sympathetically re-backed dark brown calf spine with raised bands and blind tooling. No labels. Pages evenly browned throughout, with some staining, but not affecting text. Overall a good copy of the very rare first. 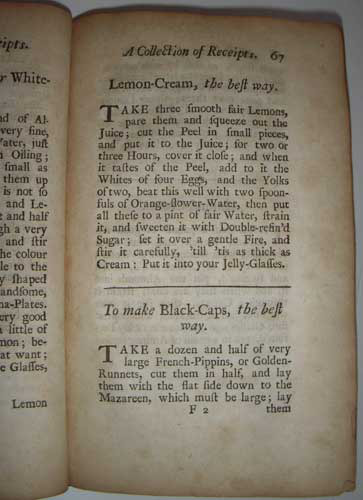 - Mary Kettilby's first edition of 1714 has the first printed recipe for "modern" orange marmalade. Interestingly it was the Scots who moved marmalade to the breakfast table, complete with finely cut peels, or chips, to use the Scottish term. There it joined scones, sausages, game pies, trout, roast beef and sometimes a haunch of venison on the sideboard. The traditional Scottish breakfast was certainly not for the meek or those of delicate constitution or stomach. Not until well into the 19th century did the English follow the Scottish example and abandon the eating of marmalade in the evening (originally a post-dinner digestive rather than a jam). Mrs Kettilby's formula called for whole oranges, lemon juice and sugar. A contemporary recipe for home-made marmalade, that of Shaun Hill, owner of the Michelin two-star Merchant House in Shropshire, differs only slightly, using whole lemons along with the oranges and sugar. "Homemade marmalade", he says, "is superior to anything you can buy", and he made twenty cases of Seville oranges into marmalade each January when he cooked at Gidleigh Park in Chagford, Devon, a prominent country-house hotel. I should imagine there would not be a lot of difference in taste between Hill's recipe and that of Kettilby's due to the presumed consistent taste of oranges over the centuries. For the Use of all Good Wives, Tender Mothers, and Careful Nurses. By several hands. The FOURTH EDITION. 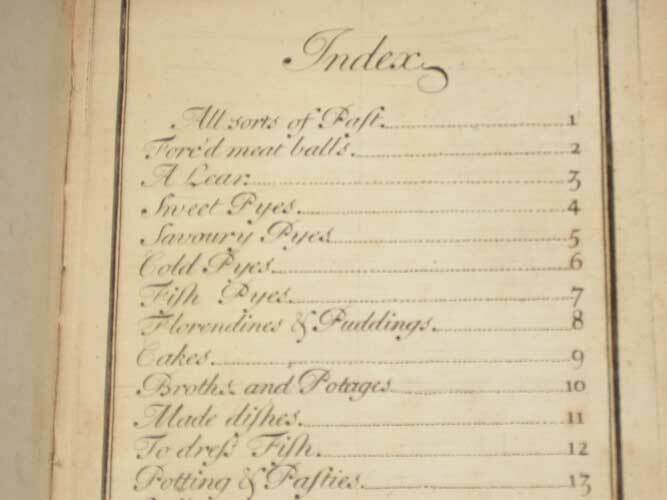 To which is ADDED, A SECOND PART, Containing a great Number of Excellent Receipts, for Preserving and Conserving of Sweet-Meats, &c. LONDON: Printed for Mary Kettilby, and Sold by RICHARD WILKIN, at the King's-Head in St. Paul's Church-yard. M.DCC.XXVIII. 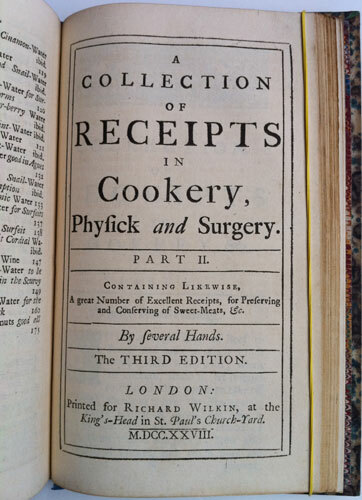 SECOND TITLE: A COLLECTION OF RECEIPTS IN COOKERY, Physick and Surgery. PART 11. Containing Likewise, A great Number of Excellent Receipts, for Preserving and Conserving of Sweet-Meats, &c. By several Hands. The THIRD EDITION. Printed for RICHARD WILKIN, at the King's-Head in St. Paul's Church-yard. M.DCC.XXVIII. 8vo. 1fep. Title page. (1)iv-viii Preface. (1)10-183. 7p Index. Second Title page. (1)194-272. 4p Index. 2feps. Full original dark brown calf boards with a little wear but nice patina, with faded gilt line all around the edge. Spine re-laid in dark brown calf with raised bands and a bottle green label and gilt lettering. Internally slightly age-browned but otherwise a good copy. 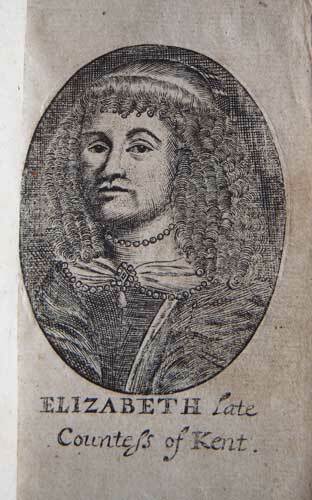 There are two manuscript inscriptions by Eliz. Thornby March 25th 1792. 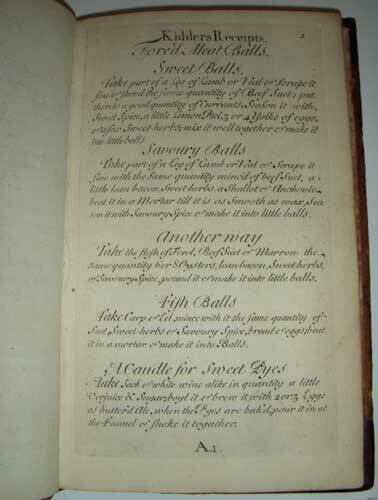 - This fourth edition has a second part - third edition, but they are both dated 1728. Mary Kettilby's name appeared on the Title page for the first time in the second edition. 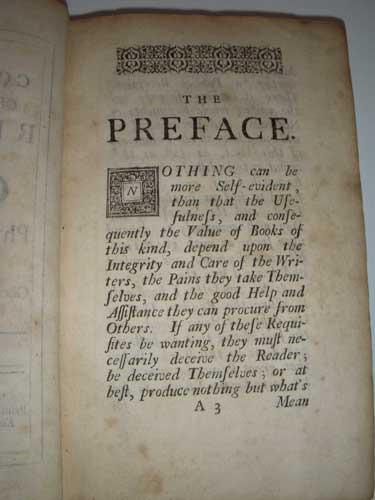 The BL holds a 1734 edition that also states 'fourth edition' on the title page but which the BL calls the fifth. It also has a 7th edition of 1749 with a second part stating the 6th edition of 1746. 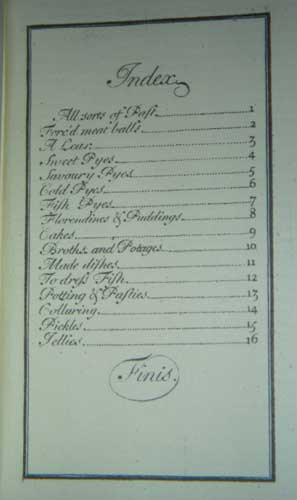 The different dates to the second parts came about due to the fact the first edition of 1714 had no second part, they only started appearing on the second edition of 1719. 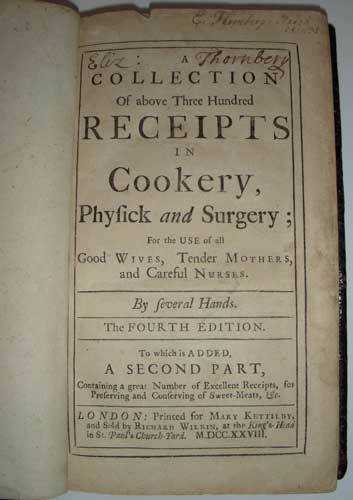 FIRST EDITION 1714. 8vo. Pp. Half title. Title page. 12. 1-218. [219-232] Full contemporary two-tone dark brown calf boards, lightly cracked with nice polished patina. Sympathetically re-backed dark brown calf spine with raised bands. No labels. Pages evenly browned throughout, with a light mark on the title page where the date was written in biro and the binder has erased the ink. Does not affect the text or border. A small strip 2 inches long by 1/8 inch wide missing from the very last page of index with very slight loss of text. The strip has been neatly repaired. Overall a nice copy of the very rare first. - In the first half of the 15th century, the English made a spiced jelly called 'Chardequynce' from quinces (or quinces and pears) and honey (or sugar). Then in 1495, only three years after Columbus's first epic voyage to America, a Portuguese ship's captain named Farnando Yanes delivered to the port of London the first consignment of 'Marmelada' to arrive in Britain. The English initially ate it as a sweetmeat or as an after-dinner digestive. It was solid, not semi-liquid, and it came in a box, not a pot. But gradually cooks began to experiment with other fruits, first using apples or at least their inherent pectin to aid the jelling process with other fruits. At this time a modern type marmalade as we know it came about. 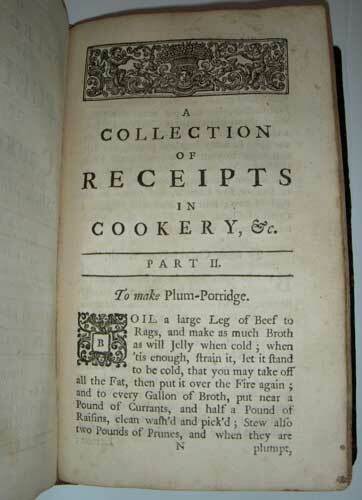 The first printed recipe for orange marmalade was published in this book, Kettilby's first edition of 1714. 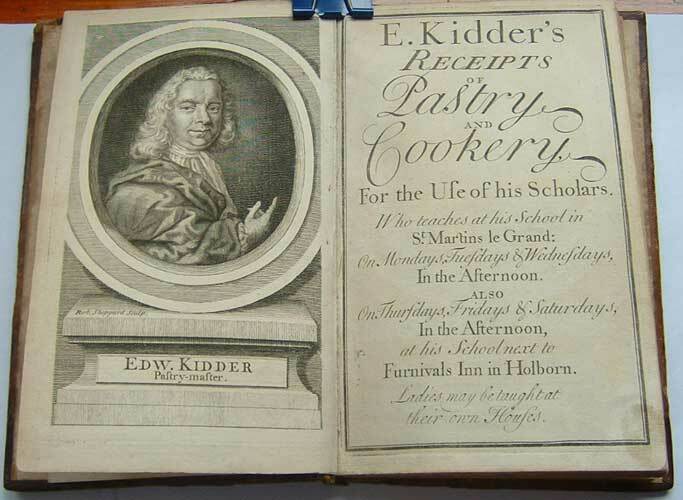 E. KIDDER'S RECEIPTS OF Pastry AND Cookery. For the Use of his Scholars. Who teaches at his School in St Martins le Grand; On. Mondays, Tuesdays & Wednesdays, In the Afternoon, ALSO On Thursdays, Fridays & Saturdays, In the Afternoon, at his School next to Furnivals Inn in Holburn. Ladies may be taught at their own Houses. 8vo. The 1st edition, 2nd issue of 1721. 1fep. Engraved portrait frontispiece by Robert Shephard. Title page, 41 leaves with the engraved text on rectos only with versos blank. Last two leaves with 'The Order for Bills of Fare' and the Index. 1fep. 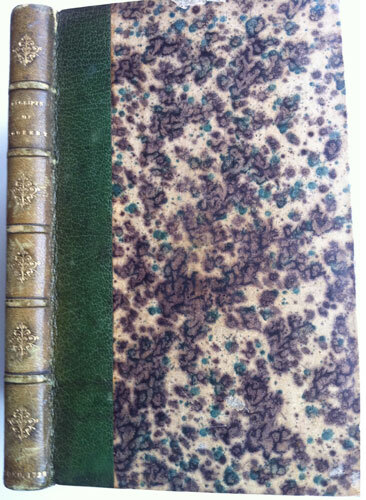 Full brown speckled sheep binding, with raised bands on spine with gilt lines and green label with gilt lettering. Internally nice and clean, with a small light oily fingerprint on the bottom corner of the title page (not affecting the text). - In reality this is not a printed book but rather a book of engravings. 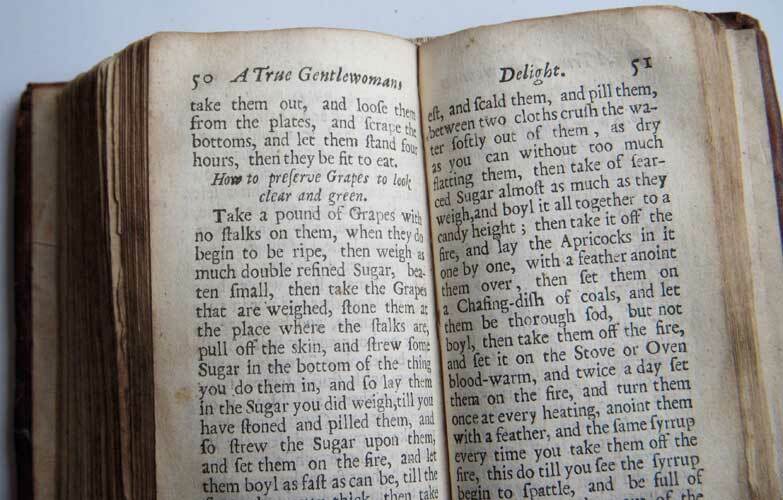 The beautifully laid out sheets of engraved scripted recipes, (with every verso blank) the elegant title page, the sculpted looking frontispiece, go towards making this one of the most handsome books, not only in cookery but any category. The portrait of Kidder is 'un-wigged', showing his natural hair. 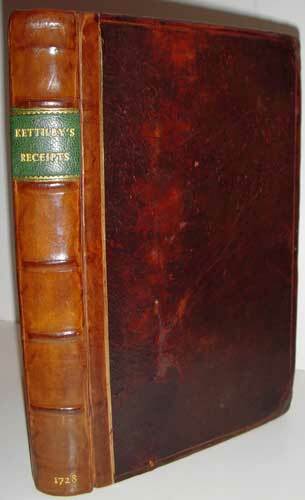 Other later editions have Kidder with wig and 8 engraved plates that were also added. 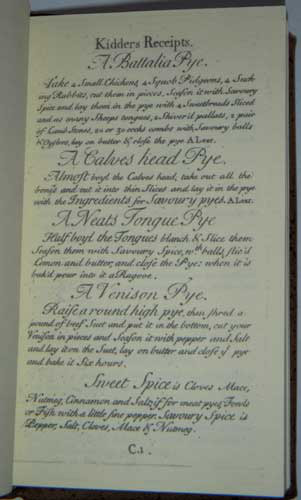 Also in later editions, pagination and recipe numbers vary greatly. This is all explained by the fact that Kidder's book only came about after his students were issued with the recipe sheets as their daily lessons progressed during their cookery course. 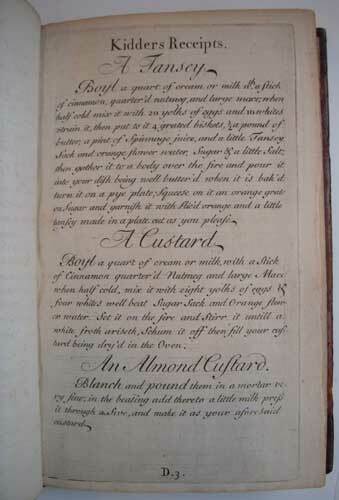 It appears from the later editions of the book, Kidder's lessons were developed and added to, though the actual recipes themselves stayed the same. 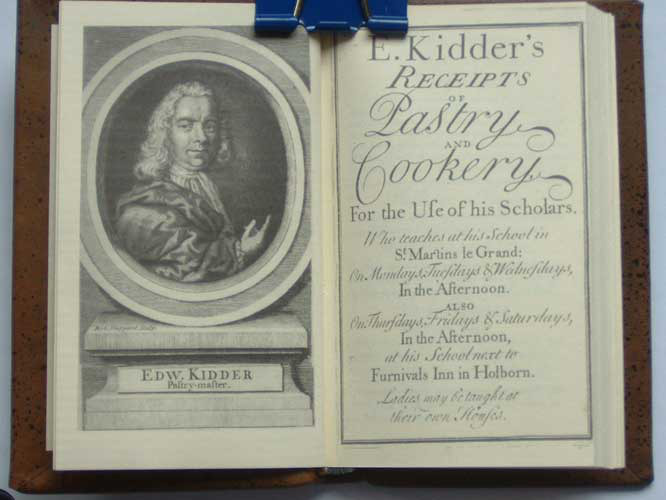 Another point of interest in the title pages of later editions, is the changing location addresses of Kidder's schools, presumably as his student numbers grew. Because of these haphazard factors, the work is bibliographically complex. Thankfully, it is greatly helped by the very good research of Peter Targett in the UK & Simon Varey in the US, whose joint study is published in Petit Propos Culinaires, Vols # 32 & 39. 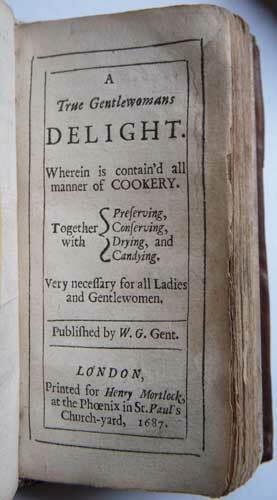 The study verifies this edition is complete as well as compelling evidence of all the other various editions and their Cookery School locations. Collectors want the later copies with the eight engraved plates (3 folding) of patterns and ornamental designs for pies and pastries. This is understandable, but the very early editions like this one, without the plates but never the less complete, are rarer still. A reprint in miniature of the 1st edition, 2nd issue of 1721. 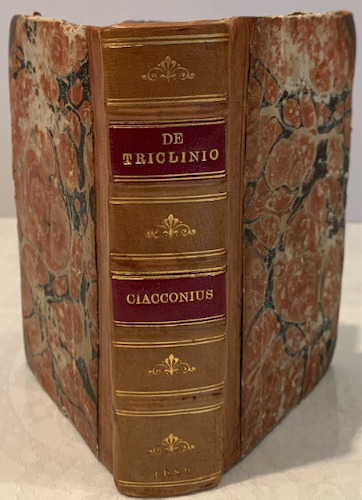 Text block - 2 1/4" x 3 3/4" Full brown speckled calf binding, with raised bands on spine with gilt lines and brown label with gilt lettering. Binding measuring 2 1/2" x 4" -- Pp. Engraved portrait frontispiece by Robert Shephard. Title page, 41 leaves with the engraved text on rectos only with versos blank. Last two leaves with 'The Order for Bills of Fare' and the Index. A beautiful and unique miniature edition. - The portrait of Kidder is 'un-wigged', showing his natural hair. 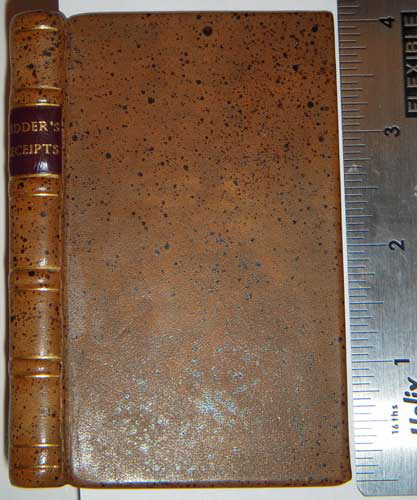 Later editions have Kidder with wig, and also have eight engraved plates. This edition does not have the plates but is complete. This is verified in the joint study published in PPC, Vols #'s 32 & 39 by Peter Targett in UK and Simon Varey in US. 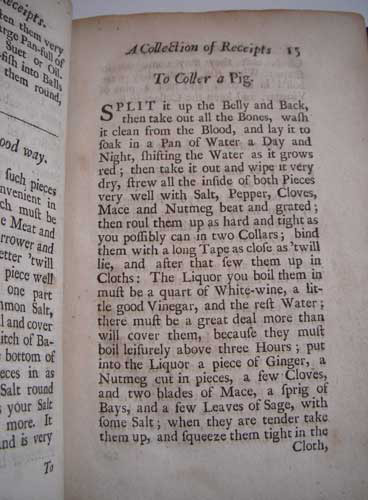 Kidder issued the recipes to his students one by one, in line with the daily and weekly lectures. The plates were issued later when he moved his schools to other locations. This is why the pagination of Kidder's books present so many variances. Hence Targett and Varey's welcome and helpful research. A beautiful and desirable item. One of a limited edtion of 300. In Imitation of Horace's Art of Poetry. 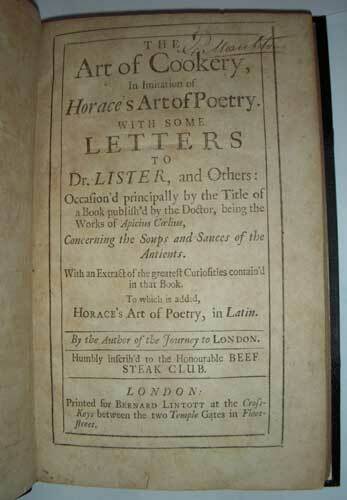 WITH SOME LETTERS TO Dr. LISTER, and Others: Occasion'd principally by the Title of a Book publish'd by the Doctor, being the works of Apicius Coelius, Concerning the Soups and Sauces of the Antients. With an Extract of the greatest Curiosities contain'd in that Book. 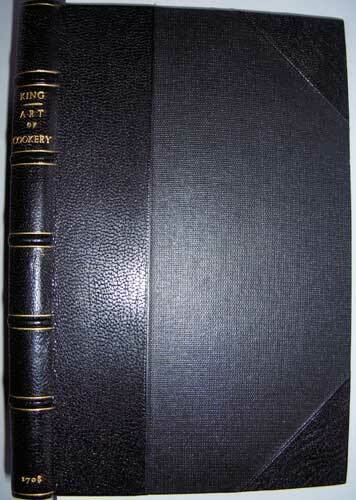 To which is added, HORACE'S Art of Poetry, in Latin. By the Author of the Journey to LONDON. Humbly inscrib'd to the Honourable BEEF STEAK CLUB. LONDON: Printed for BERNARD LINTOTT at the Cross-Keys between the two Temple Gates in Fleet Street. Undated. FIRST EDITION. 1708. Octavo (7.5 by 5 inches). 2fep. Half Title. Title Page. 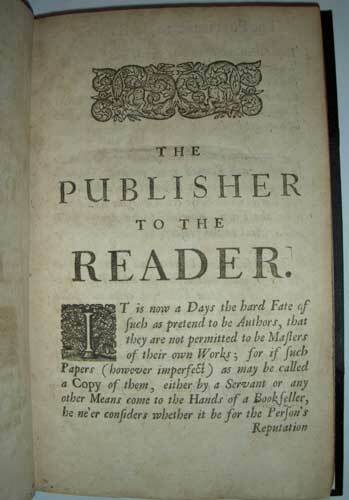 4pp The Publisher to the Reader. 1-160. 2fep. 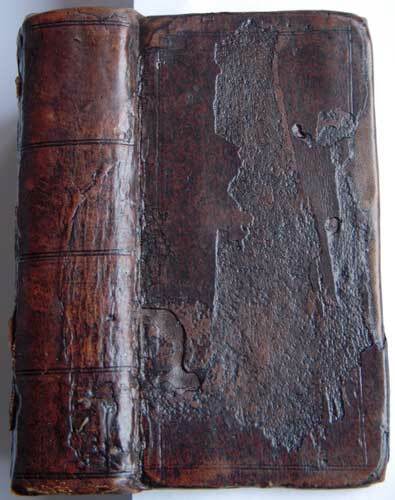 Bound in black half calf with cloth boards and calf corners. Spine with raised bands, gilt lines and gilt lettering. Internally clean however with some slight browning to Half title and title and last leaf. A nice copy of a scarce book. - There is a little, amusing, early typewritten note tipped in that states; 'The poem is in Latin, with an English paraphrase, full of good sense. Our English restaurateurs might mark the following couplet, referring to the greatest deficiency of our restaurants: 'Tis the Desert that graces all the Feast, for an ill end disparages the rest.' William King (1663-1712), English poet and miscellaneous writer. He was educated at Westminster School under Dr Busby, and at Christ Church, Oxford. His first literary enterprise was a defence of Wycliffe, written in conjunction with Sir Edward Hannes (d. 1710) and entitled Reflections upon Mons. Vaiillas's History of Heresy.. . (1688). He became known as a humorous writer on the Tory and High Church side. 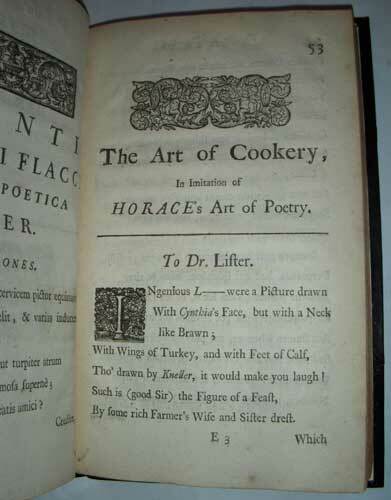 His chief poems are: The Art of Cookery: in imitation of Horace's Art of Poetry. With some Letters to Dr Lister and Others (1708), one of his most amusing works; The Art of Love; in imitation of Ovid ... (1709); "Mully of Mountoun," and a burlesque "Orpheus and Eurydice." 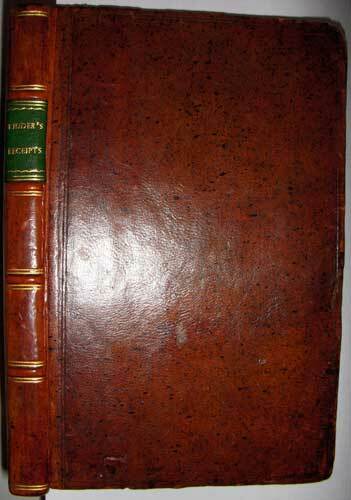 A volume of Miscellanies in Prose and Verse appeared in 1705; his Remains.. . were edited by J. Brown in 1732; and in 1776 John Nichols produced an excellent edition of his Original Works. .. with Historical Notes and Memoirs of the Author. Dr Johnson included him in his Lives of the Poets, and his works appear in subsequent collections.